I sat on the bleachers in the packed Kentucky middle school auditorium; our block class was cancelled as a result of the guest speaker. I don’t remember too much from middle school (and that’s probably a good thing). But this moment in that packed auditorium stuck with me my entire life. 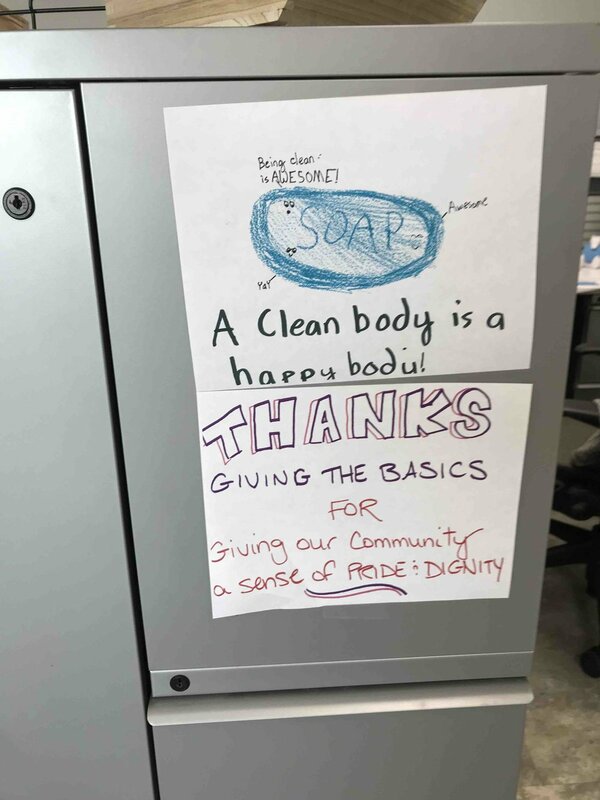 Walking into Giving the Basics, words like “dignity” and “clean” surround the walls - scribbled on thank you notes and crayon pictures, people of varying ages experiencing what is it like to have the power to be clean. 230,000 people have access to basic personal care products because of Giving the Basics. That’s just within their footprint, within the Kansas City metro and surrounds. Chances are - you know someone that receives products from them. EMBR donated 240 wipes to Giving the Basics! Standing in their warehouse of pallets of products, the team mentioned their need for wipes and how they are running out of the products. Every contribution helps, and one day we dream of being able to contribute pallets of wipes to this incredible organization that is empowering people all around the Kansas City metro to feel clean and feel worthy. “At Melissa’s Hope Orphanage in Haiti, the children are playing all day long on the concrete and not all of them have shoes to wear. This was the perfect place and perfect people to share these wipes! I decided to use the foot wipes on “Big Boss” as he was in his wheelchair coloring and his feet were dirty. He smiled as I cleaned his feet with the wipe and he wanted another one for his hands to use and smell. When the Orphanage opened up on Saturday for camp and all of the community children came over, I was so excited to give them the EMBR wipes. The second I tore the package open, the little girls could smell the lavender scent and were fighting to take a pack for their own. The kids and the house moms were absolutely in love with these wipes. Mama Charlette and I decided to distribute the a bunch of the wipes among the goodie bags for all the community children who attended camp at the Orphanage. The kids were thrilled to have wipes to bring back with them!" It starts with you. It starts with your city. There's certain people that come into your life that you are just immediately drawn to. She was one of them. I can't quite remember the moment we met, but I remember thinking that she was special. Fast forward a couple months later and I'm sitting in her house early one Monday morning, sipping coffee as her adorable angel daughters are in the living room. There's a black and white map of Brooklyn directly in front of me, a giant surfboard in the dining room, and a fiddle fig next to me. I'm about to ask, "So can I just move in, or?" The faint sound of cartoons drifts softly in the background as the girls, still sleepy, lay peacefully on the white plush rug. "Mommy," Coco toddles in, holding her sippy cup. "Can you open this for me?" My heart melts. She is the cutest thing in the world. Her loopy blonde curls just touch her shoulders as she carries a stuffed pink pig named "Pig." Makes a lot of sense. Viv is not far behind, running around in a cheetah print skirt. She plays with my llama keychain, and Hannah, the mom, tells me a story of how flamingos are Viv's favorite right now. For her first day of school, she bought her a flamingo keychain, and she can't wait to give it to her. I tell her about EMBR – I can't help it, I'm just so excited. About how we're going to wash the feet of those who need it. Of how being clean is a luxury, it's a gift, that we have. Of how I can't wait to go back to the village I grew up in and hand out these beautiful little "gifts" to the girls there. Two weeks later, my phone lights up. I see Hannah’s name. She says, "Literally just today I was reminded of the importance of what you are doing. We were at the Plaza and I brought a snack to this homeless woman and she asked if I had any wipes on me because she had soiled herself. I had just run out of them in my purse this morning so I couldn't help her and it felt horrible. I say that as a form of encouragement to continue with the hard work of getting EMBR of the ground!! There is such a need for it!" My eyes fill up with tears as I stare at her message. I picture this woman's face, her eyes. I don't know her story but it doesn't matter. She deserves to be clean. To feel clean. She doesn't live halfway across the world in a village. She's hurting, without the ability to clean herself, and she's two miles down the street from me. In one of the nicest areas of Kansas City. "We are going to wipe her feet," I text Bre. Bre texts back, "I am crying." I text back, "Me too." Insert emoji of tears streaming down that little smileys face. Incredibly accurate these days. Two days later Hannah shows up for our first EMBR photoshoot, which was a whirlwind of laughter, lavender wipes, pizza and a lot of sweat dripping everywhere. But within one day, a whole crew of some of the BEST people we know assembled. Community is a powerful thing, and we have the most beautiful friends with even more beautiful hearts. Coco and Viv are running around in the backyard with white sundresses, waving the wipes around, giggling and laughing. They’re having the time of their lives. Hannah whispers to me, "Ok, so I have to tell you this. Viv woke up this morning and said to her sister, 'Coco, we have a photoshoot today so that we can wipe that lady's feet.'" And I just melt. Those girls are going to change the world someday. They are learning compassion and generosity before they are even five years old. That is the heart of EMBR.